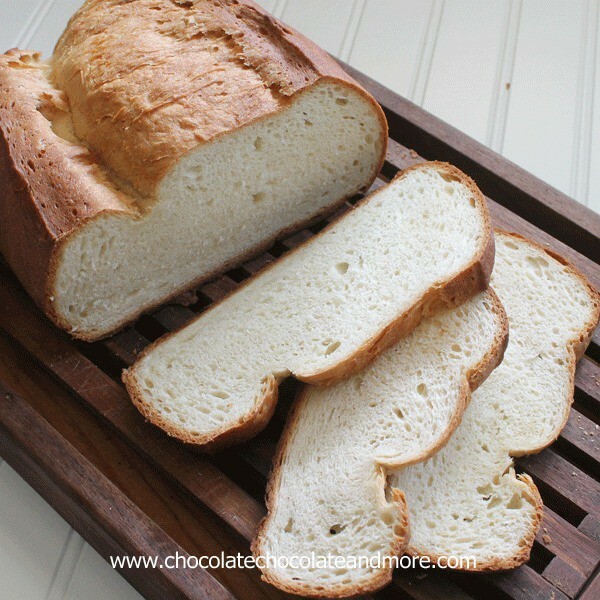 Potato Bread - Chocolate Chocolate and More! Potato Bread-made with instant potato flakes means you don’t have wait for leftover mashed potatoes to make it. I have to tell you about this potato bread. First off, it’s good, like addictingly good. So good that you might as well just plan a meal of bread and butter good. You can pretend and make a small salad to go with the bread but really, we all know what’s gonna happen. But that’s not what I want to tell you about it. I want to tell you about the photos of this bread. These are not the original photos. I went on a baking spree. Ok, we just couldn’t get enough of this bread. I even made it as teachers’ gifts at the end of the school year. I took it in, still warm from the oven. I made big loaves, I made mini loaves. I made it in a loaf pan, I made it free form. And each time, I took photos. The first time I took the photos, I forgot to put my memory card in the camera. I can’t tell you how many times I’ve done that. My camera needs a loud alarm that says stop you dummy, there’s no card inserted! I bake more potato bread, I make sure the card is in the camera this time. Of course I’m not a person to take photos and immediately go edit them. No, I let them sit on the memory card for a week or more before removing and loading onto my computer. I still haven’t figured out what went wrong. But the photos weren’t on the memory card. Again, I need a loud alarm, hit you over the head, doesn’t let you take a picture-notification. I needed a new memory card as back up anyway. Now that I’ve finally got photos, I can just make this bread because we enjoy it. Combine yeast, 1/2 teaspoon sugar and warm water in a small bowl, stirring until dissolved. Let sit until foamy, about 10 minutes. In mixing bowl, stir together potato flakes, milk, oil and remaining sugar and salt. Stir in yeast mixture. Add flour, 1 cup at a time, making sure to completely blend in. Once all flour is added, knead bread, either by hand or with dough hook attachment for 8-10 minutes. Place dough in a greased bowl, cover loosely with plastic wrap and let rise until doubled, about 45 minutes. Turn dough out onto lightly floured surface. Knead 6-8 times then roll out to about a 9-15 rectangle. Roll dough from short end then tuck ends under. Place dough on a lightly greased baking sheet or in a lightly greased loaf pan. Cover and let rise for about 30 minutes. Preheat oven to 350 degrees, just before baking, with a sharp knife, add on long slit or 3 smaller slits across the top of dough. Brush top of loaf with olive oil. Place in oven and bake for 40-50 minutes, until bread is a deep golden color and sounds hollow when thumped. 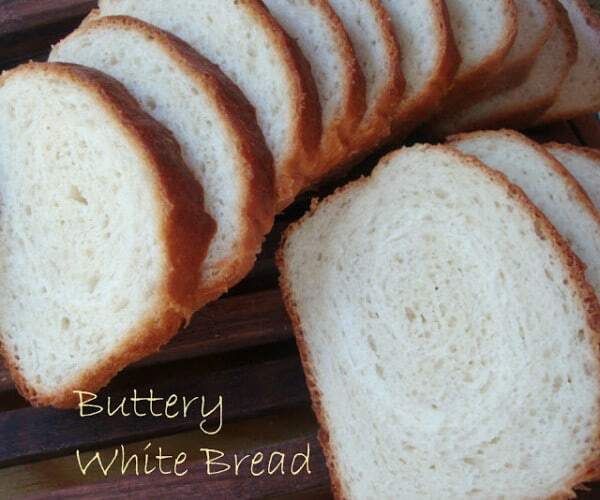 Want more easy and tasty bread recipes? Your bread does look really good! Glad you get to enjoy it now that the photo sessions are behind you! 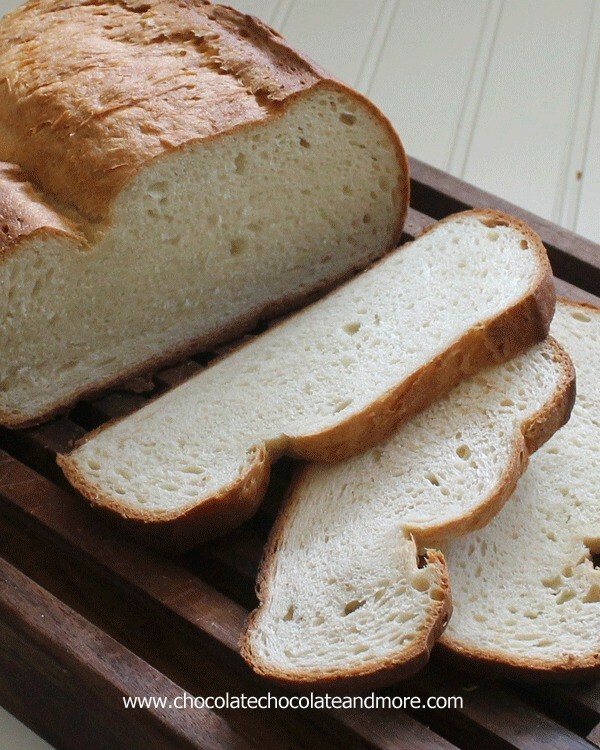 I don’t even need a picture of this bread to know its’s GOOD! I love it Joan! 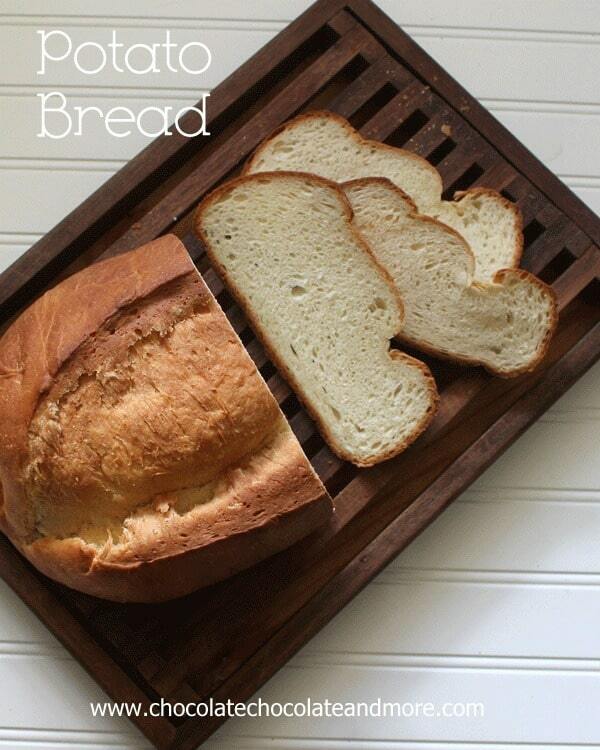 Homemade bread is one of my most favorite things in the world. And this is just in time for the school lunches! Ahhh that’s a lot of hassle! Glad you finally got these amazing photos-this bread looks perfect! Gotta love a good load of potato bread! You’ve rekindled my potato bread making addiction. The bread looks delish. watch out, this bread is addicting! Potato bread is one of my favorite things ever! I’ve never made it with potato flakes, but I love that! Then, I can make it whenever I want and don’t have to wait until I have leftover mashed potatoes. Thanks for sharing this, Joan!! Wendy, I’m so glad this recipe worked for you! 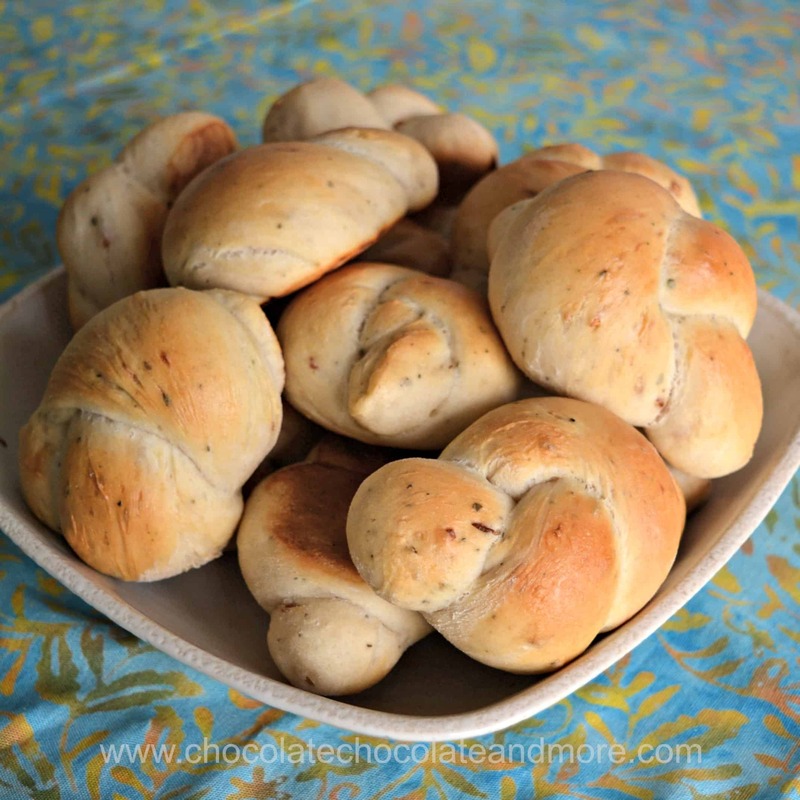 You’d better watch out, the more you make fresh bread, the more addicting it becomes! Joan, all I have is AP Flour. 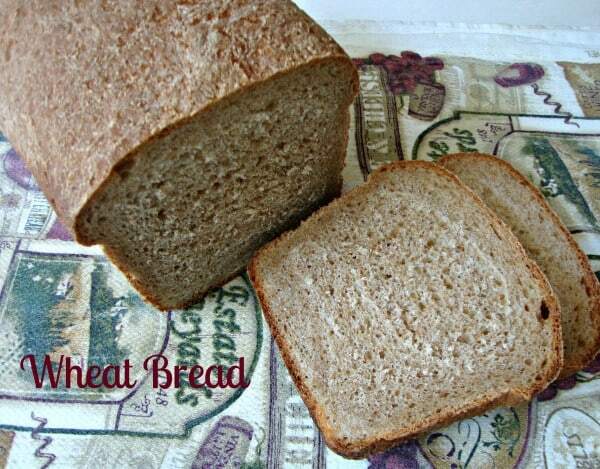 Can I use it instead of bread flour? I love your recipes. I’m very happy to see this recipe. I had a recipe years ago for a “Potato Whole Wheat Bread” recipe, that I have lost somehow in my move from CA to NY. It called for instant mashed potatoes, and powdered milk. I think I can adapt this recipe to make it. The recipe was in an old Fleishmann’s paperback cook book that a friend gave me. It made 2 loaves of bread, 2 dozen rolls, or 1 of each. I made the rolls in a 9″ cake pan. This bread looks delicious. can it be baked in bread machine. I don’t have a bread machine but if yours can hold about 4-5 cups of ingredients then you can certainly make the dough in the bread machine.